When Austin gets cold for two months of the year, I rejoice. My EDC MTAC is wicked pissah comfortable, but nothing really beats OWB carry. To all you open carry folks, consider me jealous. Normally I reach for my Comp-Tac Paddle Holster, but this year I decided to try their Minotaur Gladiator which is kinda like an OWB MTAC. Functionally, the backing and kydex are the same, but the rig uses two adjustable belt snaps to attach to my Comp-Tac Countour Belt . . .
A holster should do two things really well. Retain the gun and cover the trigger to prevent accidental discharges. In those two categories, the Gladiator does a jam-up job. Like every hybrid holster I’ve tested from Comp-Tac, this one needed a few days with a sock wrapped gun stuffed in it to stretch the leather. Once it was expanded adequately, retention was solid, but with a smooth draw — just what I have come to expect from the Comp-Tac hybrids. Retention can be adjusted using the two screws near the business end, and one near the trigger. I highly recommend using Loctite on the screws since Comp-Tac doesn’t use a locknut on the backing. A holster should do two more things to be truly great. First, present a solid platform for a draw. Second, provide concealment (if you don’t live in an OC world). In these two categories, the Gladiator comes up short. Check out the picture above to see how the leather backing prevents you from getting a solid grip on your pistol when you reach for it. Keep in mind that this might not be an issue for your gun as CompTac uses a universal leather backing for their holsters and attached gun-specific Kydex shells to order. I tested this using my EDC XD(m) 3.8 9mm Compact. As for concealment, feel free to ignore the next few sentences if you open carry. 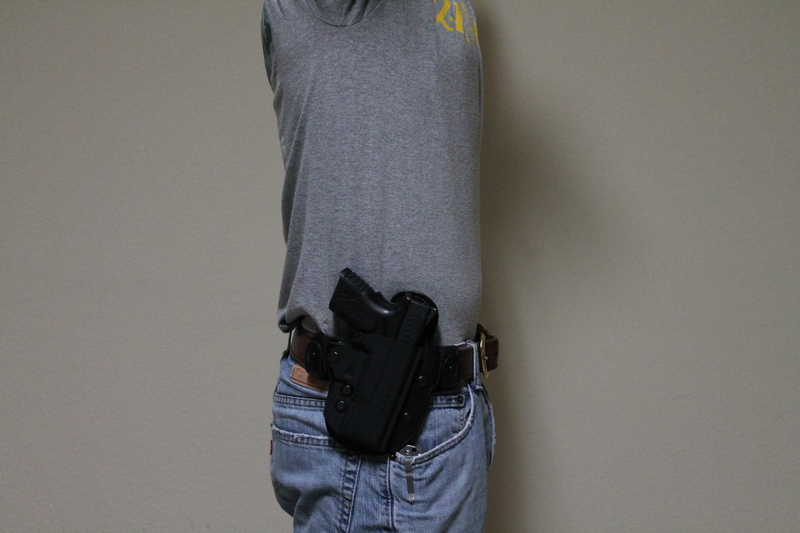 If you intend to use this holster for concealed carry, though, plan on wearing a long jacket or untucked shirt. If you’re going to tote a long slide gun like a 1911 in a Minotaur Gladiator, plan on an extra long jacket and maybe hiking your pants up a bit. 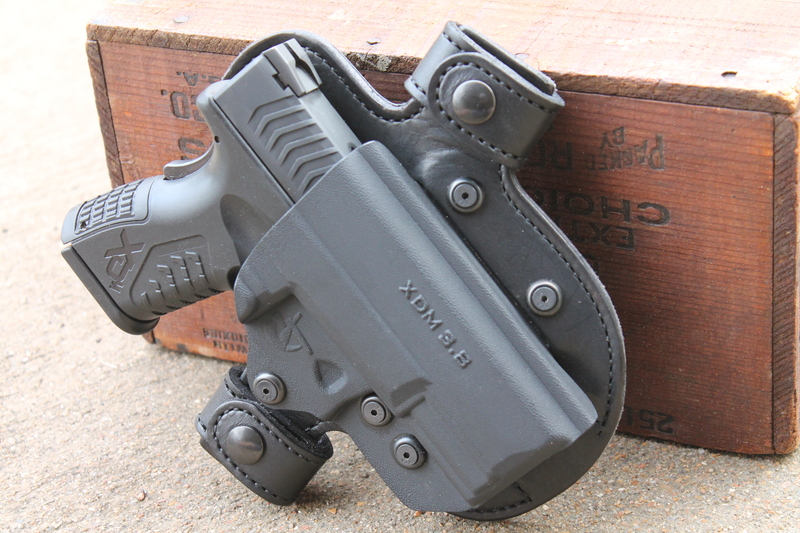 What you see in the picture above is a compact pistol in a holster that is very long. Ride height aside, I thought the Gladiator did a great job of keeping my carry piece in a profile slimmer than (insert Israeli supermodel here). This is generally hard to do with a belt-attached OWB holster, but Comp-Tac seems to have that figured out. I’m sure a liberal bit of Kydex and stiff leather helped. And those belt snaps sure make it easy to pop the rig on and off while you walk in and out of post offices, polling places and offices that don’t allow concealed carry. Top notch as always, but I’d love to see Comp-Tac move to locking nuts so retention could be adjusted without worry of losing hardware. The Gladiator is very easy to get on and off thanks to those belt snaps and it stays very close to the body. 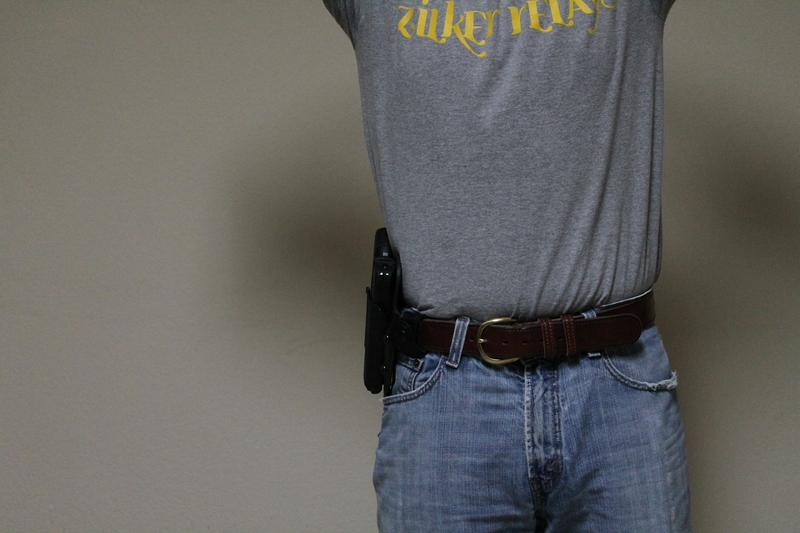 However, you’ll need a longer shirt or jacket to cover the holster if you’re going to carry concealed. Thanks to the standard leather backing not quite conforming to the shape of my pistol, it was very hard to get a good grip on the gun during the draw. 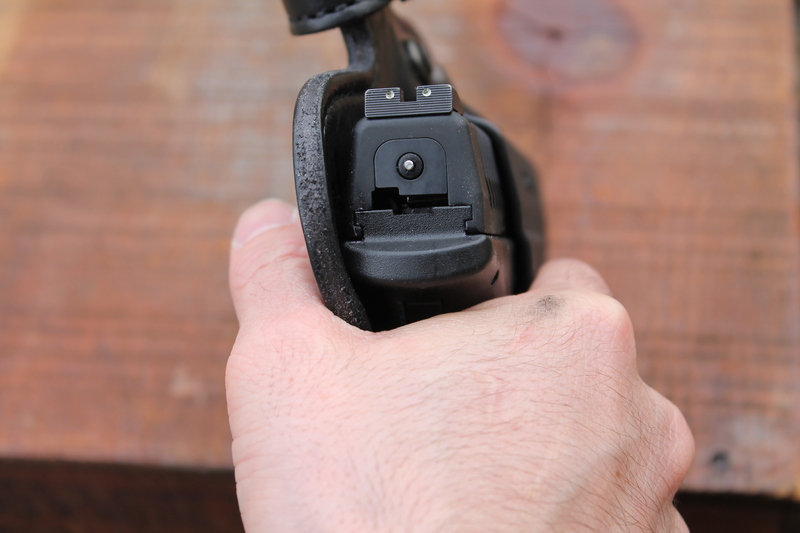 It requires much more emphasis on the fingers vs. the thumb for grip as you need to clear the gun from the holster by a few inches before your thumb can start to make contact with the gun. Given those draw issues and the ride height, I don’t think the Gladiator is worth the $90 price tag. I like OWB carry, but I like being able to get my gun out securely more. If the leather backing fit my gun better and it rode a little higher, this would be an absolute winner. I like everything but that safety in the hand grip. Real guns don’t need that. I like. I really want a hybrid OWB holster. Especially an OWB I can take off without undoing my belt. This looks like a possible win. Another happy user here. I have this for both my Walther PPQ, PPS, and my SIG 229. It’s my favorite home carry solution for all three platforms. Extremely comfortable, works well even with more normal belts on the lighter guns. Very easy to put on/take off without the mess of having to undo your belt. Also, unlike the more LEO style OTB holsters I used to use, it holds the gun in tight to the body making it, not really more concealable, but more subtle and since it doesn’t stick out much it doesn’t tend to get snagged on things during normal household chores/activities. Seems like every time I went into the storage shed I’d manage to somehow end up with some cord wrapped around the thing. I can confirm the draw issue mentioned above isn’t a problem at all with the bigger, longer grip guns, and I find the PPS version works almost as well, no complaints here, although I do have slenderer hands than average, YMMV. I find this holster, a N82tactical Pro IWB (I adore the retention system on these), and a Desantis Super Fly/Remora for pocket/misc use (range bag/gun safe) covers my firearm toting needs. That’s awesome feedback. Thank you so much for posting it. We really appreciate it and I’m sure CompTac does as well. I’m a big fan of the MTAC, but never really saw the point in trying to adapt it as an OWB holster. I swear by the leather/kydex hybrid design of the MTAC for IWB carry, but there are simply better options for OWB carry. I’m a fan of the Galco Side Snap Scabbard. Like this holster, I love the fact that it can come off and on easily. I’ve purchased a couple of other Comp-Tac holsters and love them. I was considering the Gladiator as an improvement to the Galco. I would be using it with a sport coat, so coverage isn’t a problem, and I’m more concerned with how tightly it pulls the gun in to the body. If anyone has any thoughts regarding this issue, with respect to these two holsters, I’d love to hear them.